It’s about that time of year. The U-haul trailers parade through campus, and old couches clutter the curbs. Soon, textbooks will be bought, awkward ice breakers will be endured, and late night dinners after the library will be cooked. 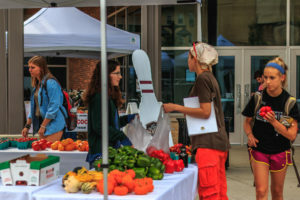 And with the start to the fall semester comes the new season for the Campus Farmers Market, the Wisconsin Union’s stage for local food vendors and also a venue for food education. “It really just started as a way for us to bring students closer to the farm fresh foods available in the community,” said Meghan Roberts, a marketing strategist for Union Dining Services. The market pops up on on Orchard Street outside of Union South every Thursday morning from Aug. 31 to Oct. 19th. The vendors will sell everything from apples to baked goods this year. “We have a diverse product offering which makes it like a mini version of the Dane County Farmers’ Market,” said Abby Reinecke, Wisconsin Union marketing intern. But, in addition to the fresh food, the market also offers an educational experience to students who visit and shop. Each week, local food producers create a farm-to-table style recipe bag. Each bag contains all the ingredients needed to make a specific recipe and, at the market, is a demo table, where a chef demonstrates how to cook the meal. According to Roberts, the farm-to-table bags are popular items and are great for dorm and apartment cooking, where complicated or niche cooking equipment is scarce. 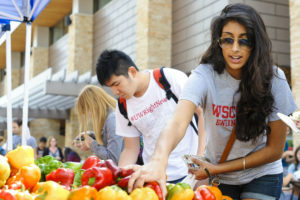 “It’s the Wisconsin Union’s goal to partner with all areas of campus to include aspects of sustainability and education in the market, because that’s what we do here at the Wisconsin Union, “Roberts said.